Giveaways are one of the most exciting things I find when I visit any blog. I know it is the same with you, so I thought to have an impressive giveaway section on my blog too. I set out on a treasure hunt to bring back the best of all goodies for my blog visitors, and I have something for you so you do not go empty-handed! Presently I’ve only Hostgator and GoDaddy deals for you, but I’m hunting for more. Did you always fancy to have your own blog or website? I always did, and I got the perfect solution from Hostgator, the ultimate web hosting provider. I am very happy with their services, and I recommend it to you all. Grab this offer now, you’ll never get such a deal! :). Moreover, even if you miss this offer you’ll still get 25% off the package price if you use my coupon on any day of the year! I’ve always purchased my domains from GoDaddy, and I think they’re the best. Go Daddy Deal of the Week: 35% off your first order on GoDaddy.com! Offer expires 1/3/13. Want MORE? Get 50% DISCOUNT! My blog Aha!NOW runs on Genesis from StudioPress, and it rocks! Don’t think, take it – it’s worth it! 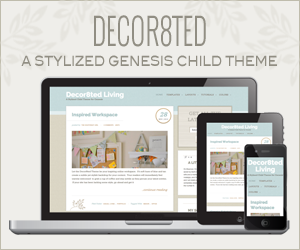 Here’s the LATEST – Decor8ted Theme! If you use Thesis, then choose the Thesisawesome skin like I do on my other blog. It saves you effort and time customizing Thesis theme. Grab it if you’re a Thesis lover!! No blog is complete without the CommentLuv plugin : the 8-in-1 plugin! All the more reason to hurry up and grab this golden plugin, NOW! Isn’t it the best time to start blogging and invest into a domain name, web hosting, WordPress theme, and a commenting plugin! I bet you’d agree, and I hope you benefit from it, and of course I too will if you make the purchase as these are my affiliate links. If you’ve any questions, do ask me. I’d be happy to help. Now, a new giveaway everyday – and it’s totally free! Well, to be honest its GAOTD who’s doing it and not me, but do have a look at what they’re offering today.